This waterfall has a journey to make as it rushes over the rock ledges to the base of the pools below in the mountain range of the Mealy Mountains in Southern Labrador, Canada. The river has carved a gorge in the mountain leaving plenty of room for the water flow as it creates one beautiful waterfall after another. Waterfall, Rifflin' Falls (un-named), in the Mealy Mountains, Southern Labrador, Labrador, Newfoundland Labrador, Canada. 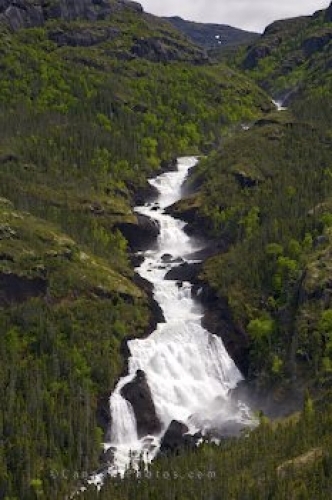 Picture of the water rushing down the mountain side in Southern Labrador, Canada.